April 22 was an incredible evening for iZōsh members and guests.124 women gathered to enjoy powerful dance performances, learn from an engaging and enlightening speaker, and participate in lively discussions around each table. And we collected more money to fund microloans than any other event so far! The evening opened with an interpretive dance by Hannah Klinkman. Hannah Klinkman is from Ann Arbor, and studied ballet, jazz, and modern dance at Ballet Chelsea. Hannah is currently studying as a full-time trainee at BalletMet in Columbus, Ohio. 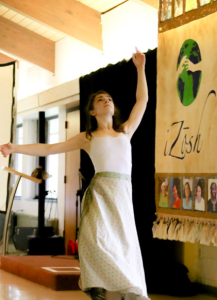 Hannah’s beautiful, poignant, and powerful performance addressed the effect that human trafficking has on families, and the sense of empowerment iZosh aims to help women discover. Robin Phillips, Chair of iZōsh, gave an introduction and explained how some of the aspects of each iZōsh event mirrored women’s Saving Groups in impoverished countries: passing a basket around the table to collect money, choosing which women should receive that money, and learning from an expert on a topic to educate the members at each meeting. 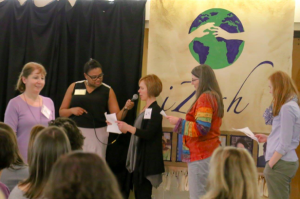 After donations were collected, members and guests were encouraged to get to know one another with an ice-breaker question: “Are you willing to spend extra dollars to buy Fair Trade items? Why or why not?” Attendees were quickly drawn into discussions and it was an effort to quiet the room again to hear the results of the first round of voting. 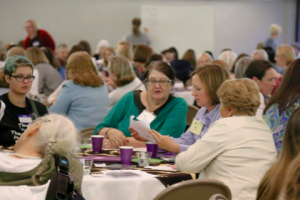 Before the meeting began, members had a chance to participate in “stone voting,” in which they chose which women entrepreneurs to fund by placing stones in a basket next to a woman’s profile. The women who received the most stones were announced, along with some information about them, and each woman was celebrated with cowbells and cheering. 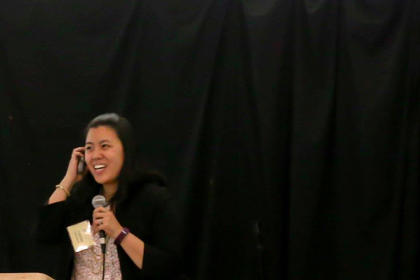 When our Keynote Speaker, Christine Chan Downer, was introduced, we learned that she had been involved at the very beginning of iZōsh, in encouraging the founders to read Half the Sky. Since then, she has worked with several high-profile government and non-government agencies and offices, assisting with various initiatives. Currently Ms. Downer serves as a consultant to International Justice Mission, and she shared stories from her travels to the Asia region where she was conducting research on the seafood industry. In her talk, Ms. Downer described the destitute lives of two different people, one working in a shrimp factory and the other working off-shore on a vessel in the ocean. Ms. Downer pointed out how funding microloans can have a direct impact on these exploited families. Then she encouraged iZōsh members and guests to do their part in other ways, too, including: using the Sweat and Toil app when shopping, visiting slaveryfootprint.org, sending letters to corporations, asking at restaurants and grocery stores where their seafood comes from, and praying for the families affected. Ms. Downer pointed out how funding microloans can have a direct impact on these families. Then she encouraged iZōsh members and guests to do their part in other ways, too. At the end of Ms. Downer’s fascinating talk, an iZōsh Treasurer announced that we had collected $16,356! Next was the second round of voting for the evening. iZōsh attendees were asked to view and discuss at their table information about two possible loan recipients. They were asked to select one recipient and send a representative to the front of the room to announce who they’d chosen. Again, each loan recipient was announced to cheers and the ringing of cowbells. As the iZōsh Loan Officers began to fund loans for the chosen recipients, members and guests participated in a book discussion. Each table had printed excerpts from The Locust Effect: Why the End of Poverty Requires the End of Violence, by Gary A. Haugen and Victor Boutros. After reading the excerpt, attendees discussed the injustice in public justice systems, and how economic empowerment – including microloans – can change a woman’s experience as it relates to that injustice. Robin Phillips and Colleen Dauw, iZōsh Vice Chair, made some closing remarks including the vision of iZōsh, benefits of membership, and the date for our next event: October 21. Then members and guests were treated to another performance by dancer Hannah Klinkman. This dance also portrayed the oppression and suffering of human trafficking victims, but included even more gestures of hope and optimism. 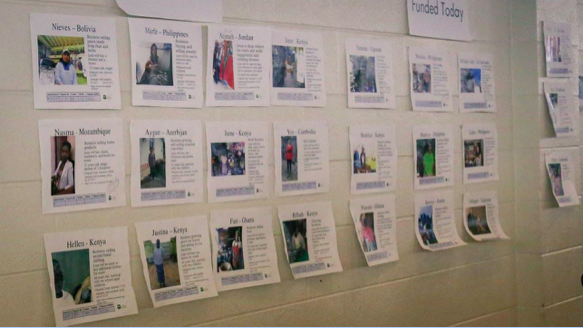 As the event concluded, iZōsh Loan Officers continued to fund microloans until the entire $16,356 had been spent.